The Sisters of the Presentation produce various publications. It is through these publications that we strive to keep our friends and family informed about our ministries and how we continue to live our mission and charism today. 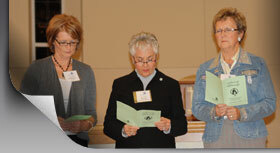 Presentation Doorways is a quarterly newsletter whose main purpose is to further the Gospel mission of the Sisters of the Presentation and our associates by sharing the news and views of the congregation with our benefactors, families and friends. Through this publication, we hope to share the charism of our congregation and invite others to become involved in our mission and ministries. Presentation Doorways is saved as an Adobe Acrobat .pdf file. To view or print the file, you must have Adobe Acrobat Reader. If you do not have Adobe Acrobat Reader and would like to download this free software, please go to www.adobe.com. 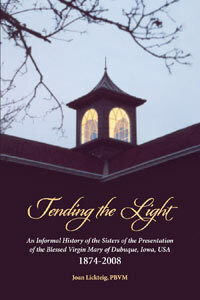 Tending the Light, a history of the Dubuque Presentation community, is available for purchase. Contact info@dubuquepresentations.org for more information.